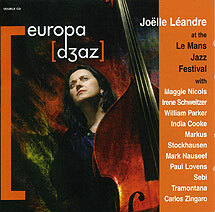 Joëlle Léandre, bass, voice with: Les Diaboliques [JL, bass; Maggie Nichols, voice; Irène Schweizer, piano] (Disc 1 tracks 1, 2); William Parker, bass, whistle (Disc 1 tracks 3, 4, 5); India Cooke, violin (Disc 2 tracks 1, 2, 3); Mark Nauseef, percussion, cheap Casio (Disc 2 tracks 4, 5); Markus Stockhausen, trumpet, flugelhorn (Disc 2 tracks 4, 5); Paul Lovens, percussion, drums (Disc 2 tracks 6-9); Sebi Tramontana, trombone (Disc 2 tracks 6-9); Carlos Zingaro, violin (Disc 2 tracks 6-9). Tracks CD1, 1-2 recorded on 26 April 2005 at l'Espal; tracks CD1, 3-5 recorded on 29 April 2005 at Collégiale Saint-Pierre-La-Cour; tracks CD2, 1-3 recorded on 27 April 2005 at Collégiale Saint-Pierre-La-Cour; tracks CD2, 4-5 recorded on 1 May 2005 at Abbaye de l'Epau; tracks CD2, 6-9 recorded on 30 April 2005 at Palais des Congres. Cover photograph (front cover reproduced above) by Mephisto, poster created by Caty Rousseau; design by Lora Denis.